Sherry is using Smore newsletters to spread the word online. 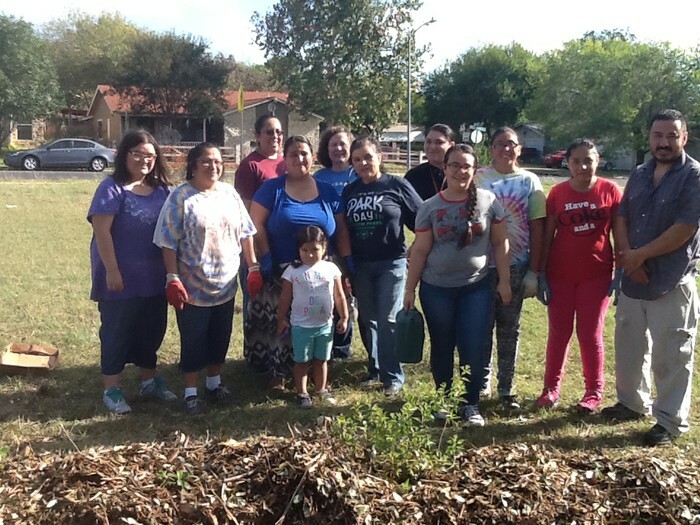 Come meet the new Director of the T-STEM Academy at Consuelo Mendez, Joanna Crowley, and a team of volunteers who will be playing in the dirt with us on Saturday, August 11 pulling weeds, and preparing for the new school year. Please dress for the weather- including hat, sunscreen, close-toed shoes. Tools and gloves will be available and you can start early on getting your community service hours! 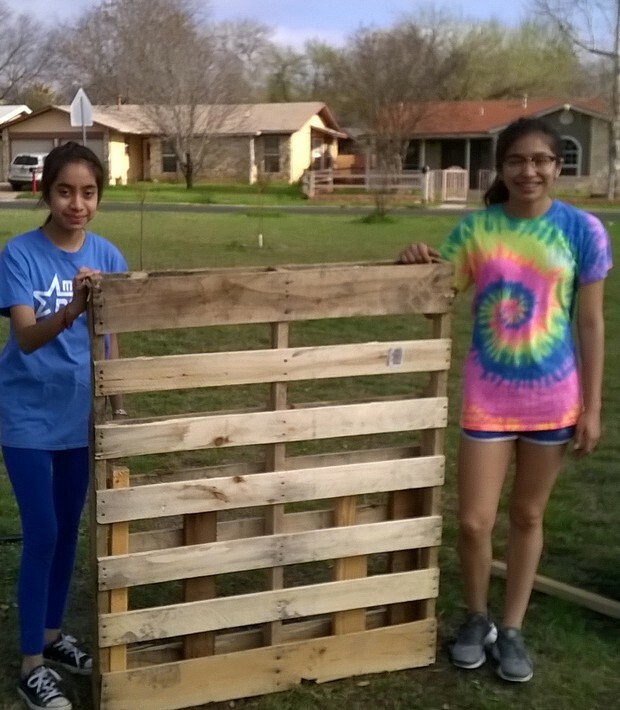 for your help in getting and preparing the best pallets for our garden projects. Can't wait to see the picnic tables for the outdoor learning area sponsored by GM and the National Wildlife Federation. 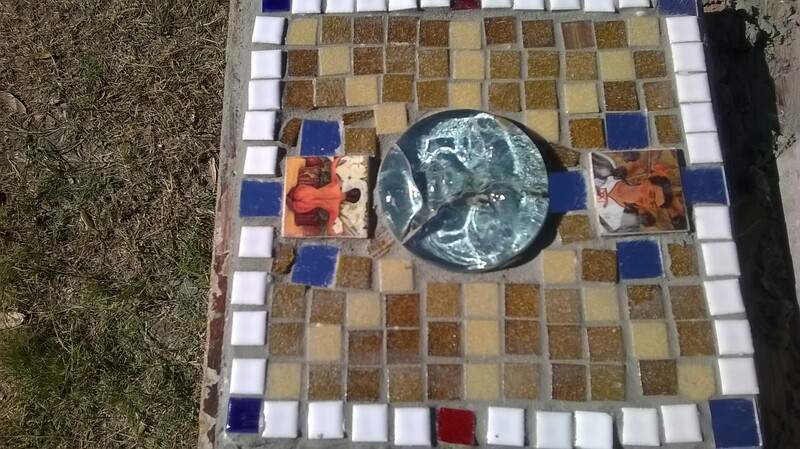 The stepping stone project began in the fall of 2017. 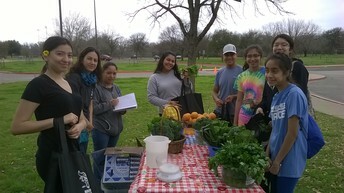 Lettuce Farm is Coming to the Dove Springs Comm Garden! 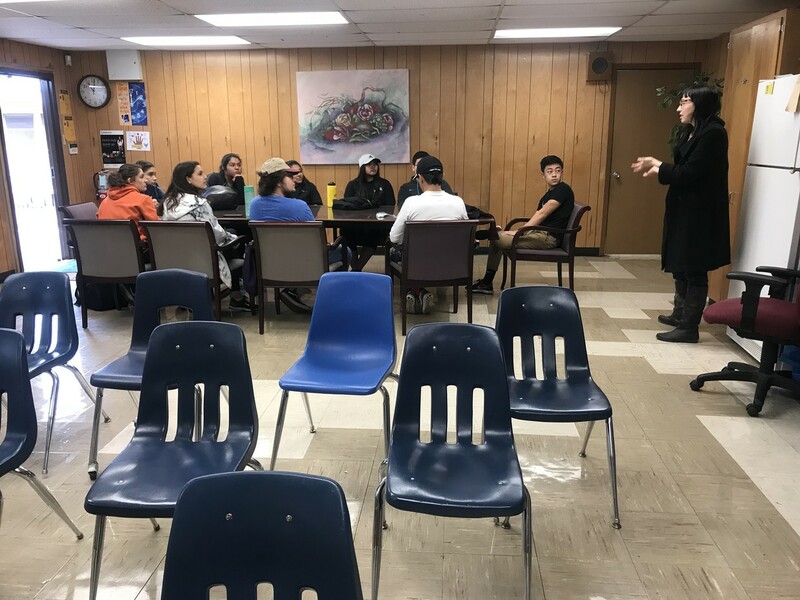 Aubrey McDonald, School Program Coordinator for Lettuce Farm, talks to the students from AKINS High School and the University of Texas who attended the February 3rd workday. Lettuce will be putting in a commercial farm at the site. 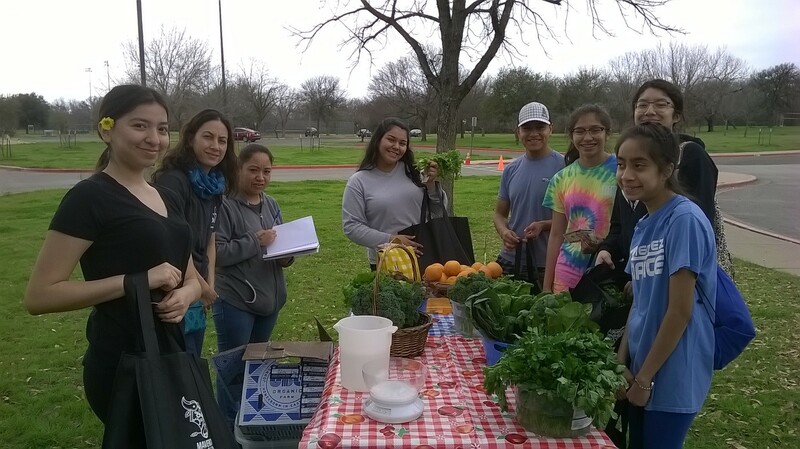 Lettuce has farm sites at four AISD campuses and this site is a pilot for their first Title 1 school. Lettuce is working with GAVA to determine what is a fair price for families in our community to pay for the meal kits that are delivered directly to your door. 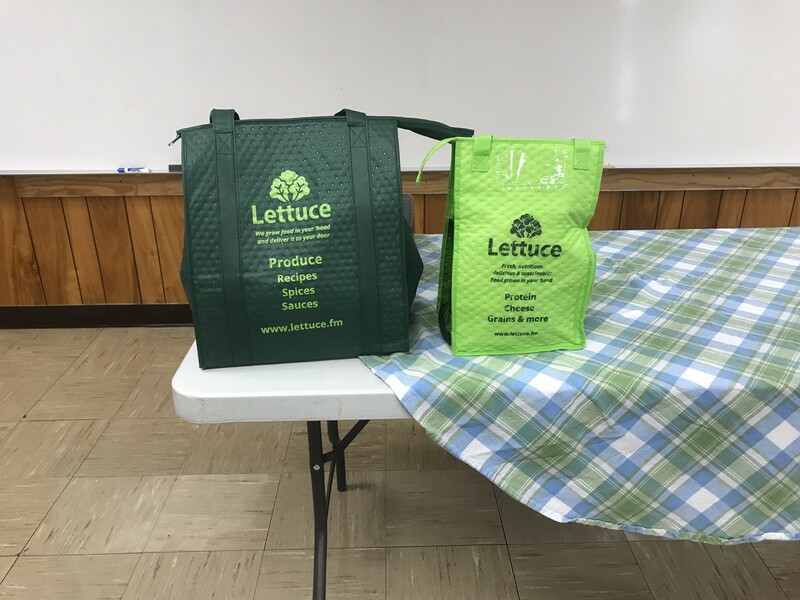 When our community signs up to be a part of Lettuce meal kit delivery a portion of the price goes to the Mendez MS PTSA. 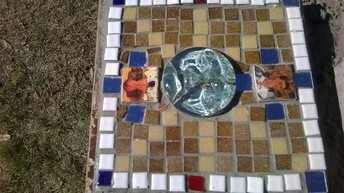 Art, design, chemical reactions- STEM in the garden is fun! Free City of Austin Mulch! 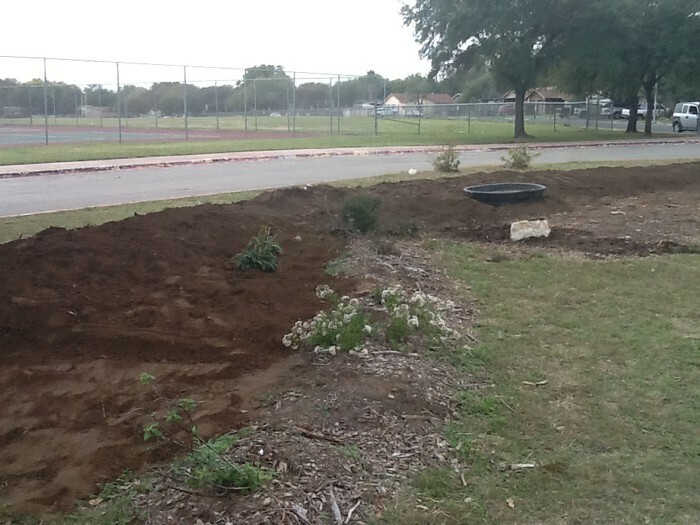 Thank you, Mr. Padilla for thinking of this to fill in the bermed area- the dirt is expensive and the mulch is FREE! 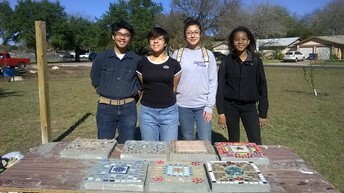 Several groups at Akins High School have adopted us! Thank you so much to the students earning service hours for their schools and area churches by helping us on the Saturday work days. 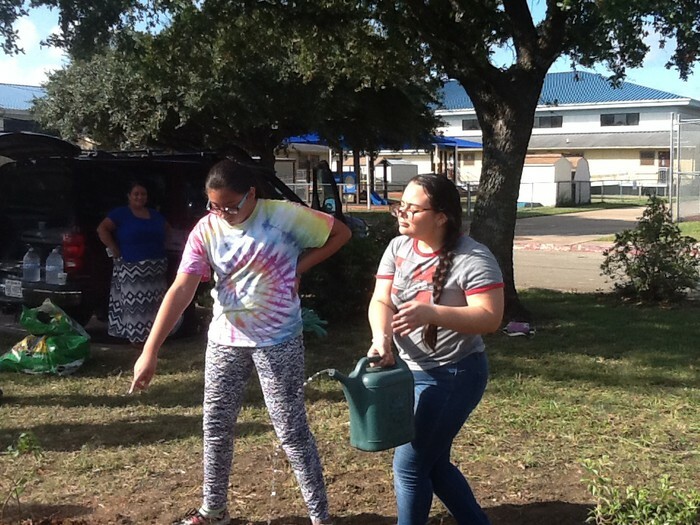 On November 4th we had students from Akins AVID, Social Services, STEM and NHS, many are former Mendez students coming back and giving back to their middle school through service projects. 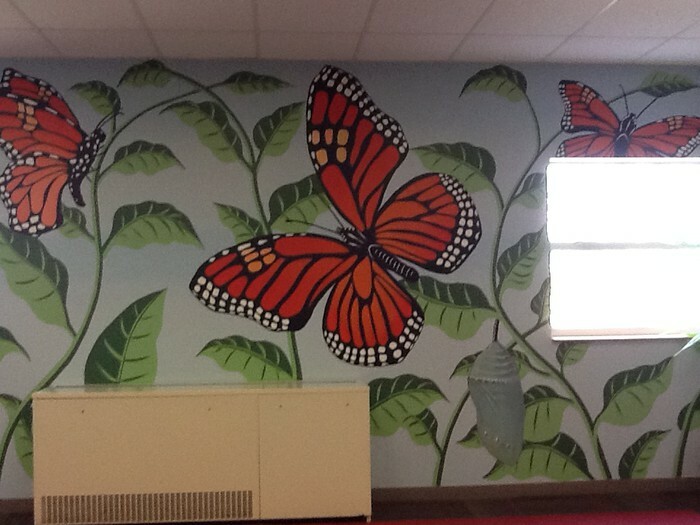 We discussed the Monarch migration, the connection to Dia de Los Muertos, and the design of the Monarch garden, which features a bermed area for flooding control filled with organic matter that will eventually decompose and become part of the garden dirt. Community Garden Leader, Alfredo Padilla, and his family were on hand - they have given countless hours to the projects in the Maverick Green STEM Academy - from assisting with the building of the chicken coop and shed to taking a crew to get the free city mulch to fill into the bermed area on Saturday. 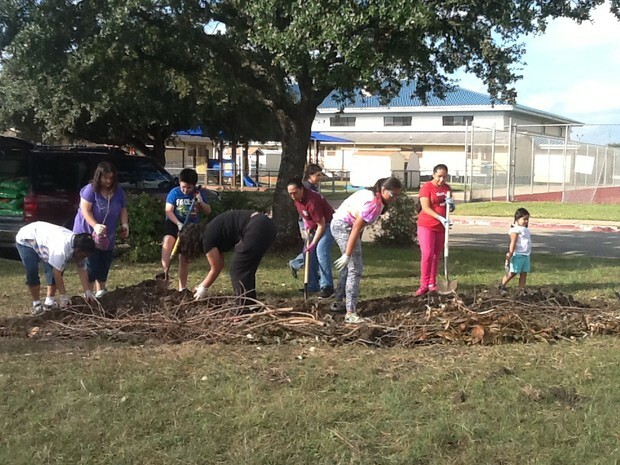 We are fortunate to be close to the City's free mulch on Business Center Dr.
Akins students split up into teams and one group cleaned the entire campus exterior grounds area - it is amazing how much trash is littered on our campus. We thank all the groups for their service, including students from our campus and Widen Elementary. That's collaboration! The Green STEM students add information to the school site. The Monarch garden will have milkweed and other pollinators. Tired, hungry and still smiling - thanks everybody! The pond will be used for swamp milkweed, which requires continually moist soil. We still need more organic matter- bring your leaf bags and leave them by the shed! 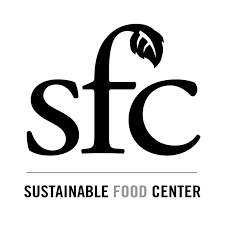 Check out our feature on Good Day, Austin - Thanks, Fox 7 and SFC! 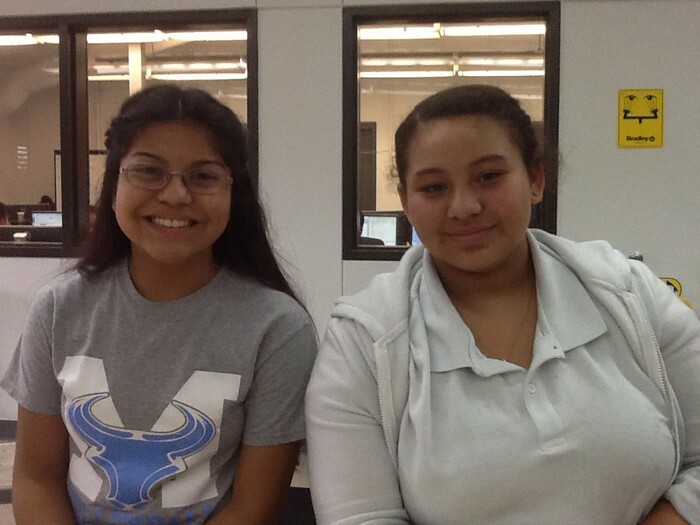 SFC Grow Local Program's Bianca Peterson and Ashley Stryker with Mendez Middle School about the program for students and a couple students share their thoughts too. 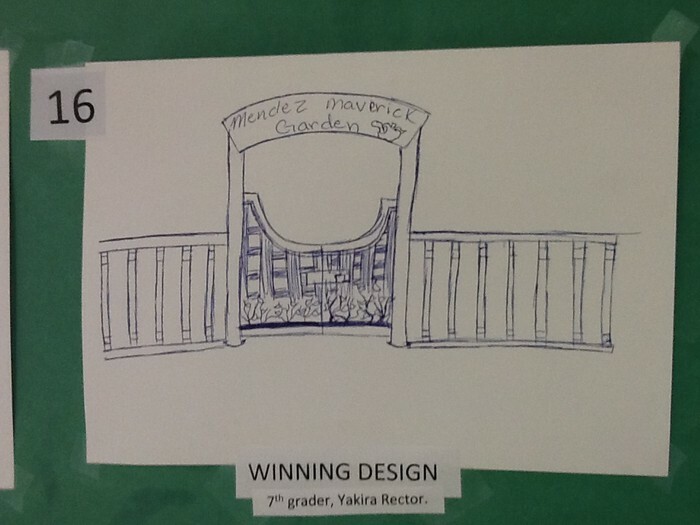 7th grader, Zuleyka will take the lead on our Monarch garden project. She is starting her Capstone Project this year and is working on the Green Ag Problem-Based Learning - Where Have All the Monarchs Gone? 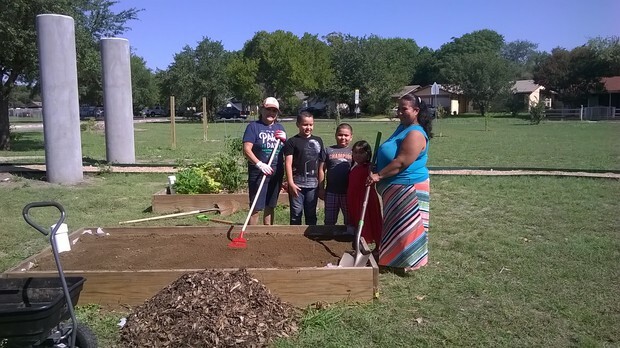 Zuleyka and her family are Community Garden leaders and helped found the Dove Springs Community Garden. This year students are designing the Monarch Way Station (a garden on the migration path of the Monarch from Canada in the summer to Mexico in the winter). Here's the Problem: Milkweed, the only plant that supports the entire life cycle of the Monarch butterfly, has been damaged by chemicals that kill the butterfly. 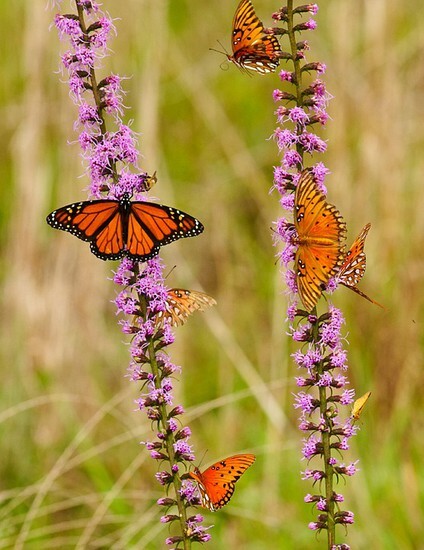 The population of Monarchs is in decline. 1. What is the best way to plant a pollinator garden that will attract Monarch butterflies? 2. What native flowering plants do we need to plant in the garden? 3. How can we propagate native milkweed to increase the supply of plants that have not been sprayed with the chemical? 4. Why is it important to be concerned about the Monarch decline in population? Why does it matter? What other factors might be contributing to the decline? 5. How do we want the garden to look so that Monarchs and other pollinators are attracted? 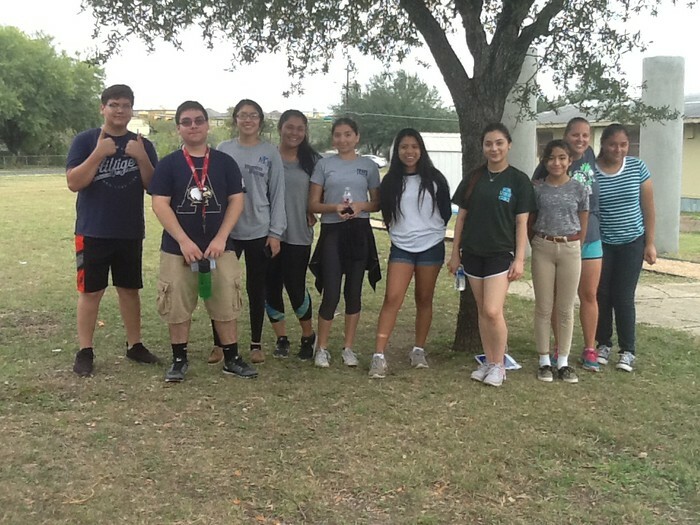 Students in the Green Ag Careers course will travel to the LadyBird Johnson Wildflower Center to explore how native plants help the ecosystem in our sensitive areas, such as the Edward's Aquifer and the Dove Springs Williamson Creek Watershed. 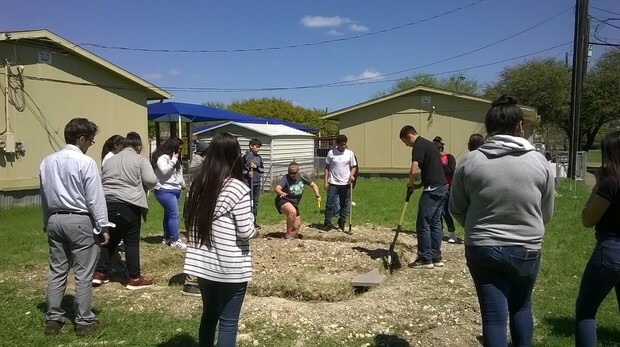 Students will also explore a cave and experience and outdoor natural play area we hope to inspire us as we design a similar area at the Dove Springs Community Garden in the future. 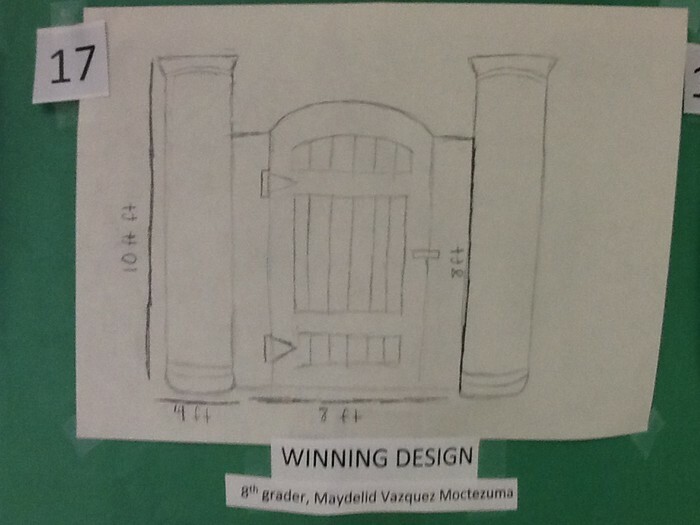 Students will submit designs for the garden to scale and use Google Sketch-Up to present their designs. 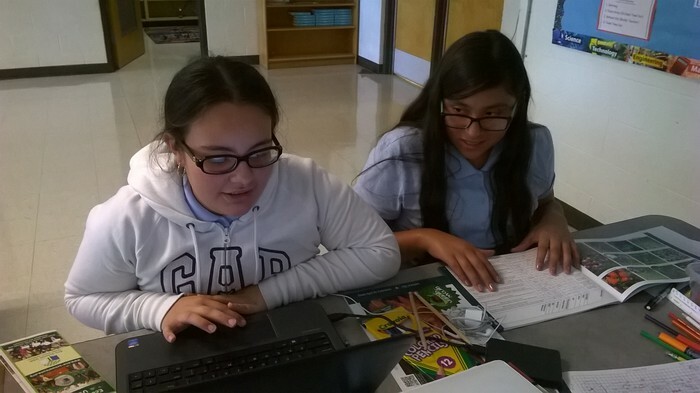 Students will research native plants, cite sources, and make recommendations for native plants and prepare a budget. 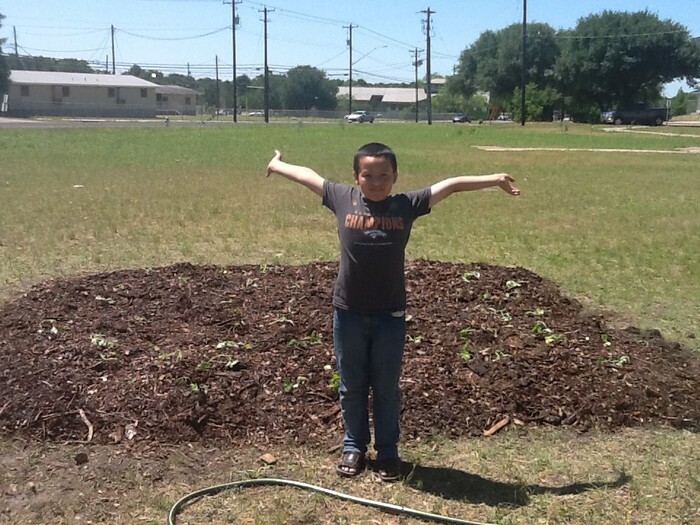 We have $2,000.00 to spend on our garden through a grant from AISD Science and the National Wildlife Federation. Students will enter data into the EcoSchools USA site to document the project. MGSA is going for Bronze level and eventually, Green Flag status. 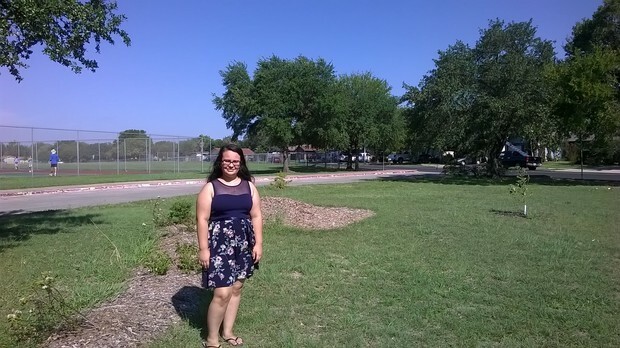 Students will name the garden and create signage in English and Spanish for the site that teaches the community about the garden, the Monarch and the importance of creating native schoolyard habitats that support pollinators. 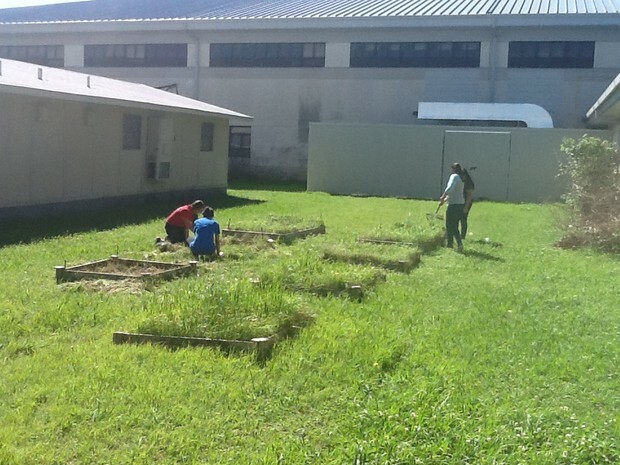 The garden will achieve a NWF Schoolyard Habitat designation- students document the project on the ECO Schools USA website. Visit our site often for important updates on our progress! 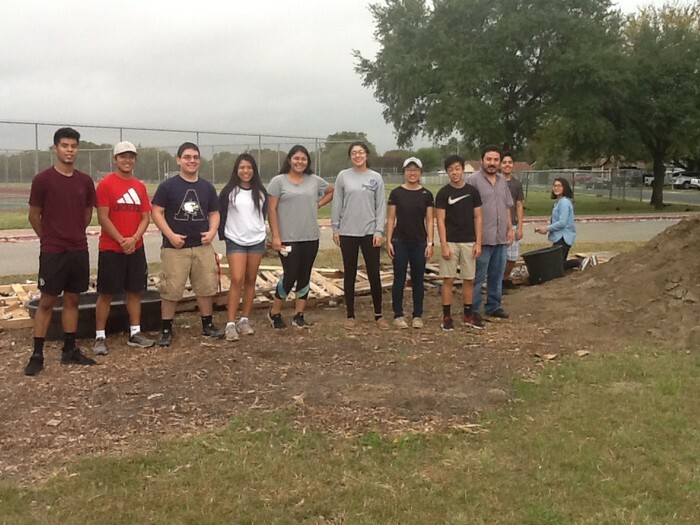 Miss Stryker's Green Ag students will be planting a fall garden for the community in the bed that the Esquivel-Santander family and our friend, Gloria Lugo helped prepare on the first work day. 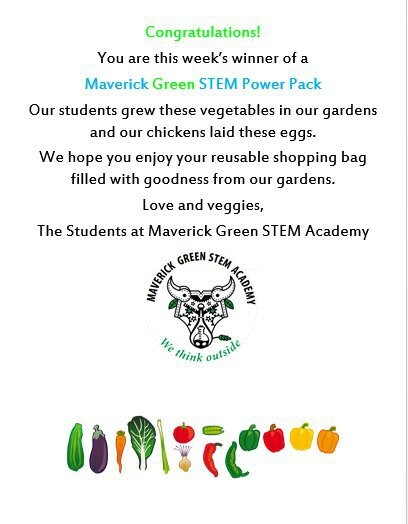 We have given away a a Maverick Green STEM Academy (MGSA) Powerpack with a dozen eggs, and fresh vegetables from the community garden every Friday this year- thanks to our Parent Support Specialist, Jessica Victoria, who helps coordinate getting the food to a deserving family. We will meet at the garden to take measurements, and then meet in Miss Stryker's classroom to begin the design for the new garden. MGSA students and teachers received a $2,000.00 grant to put in the new garden that will attract the approaching endangered species to our site on their flight to Mexico in winter and Canada in summer months. 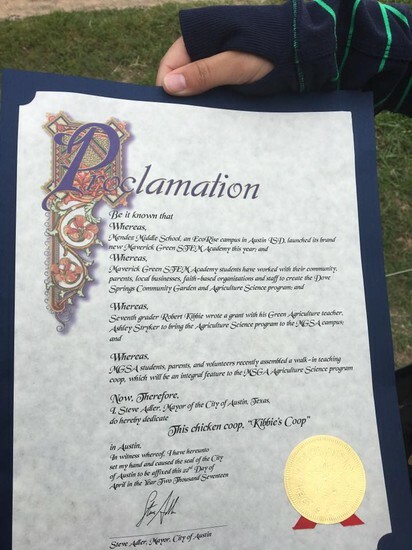 The City of Austin recognized the MGSA Director as this month's "Net Zero Hero"
MGSA Students are Monarch Heroes! Deserving families are getting reusable grocery bags with our chicken eggs, and fresh veggies from the garden on Friday's this year. 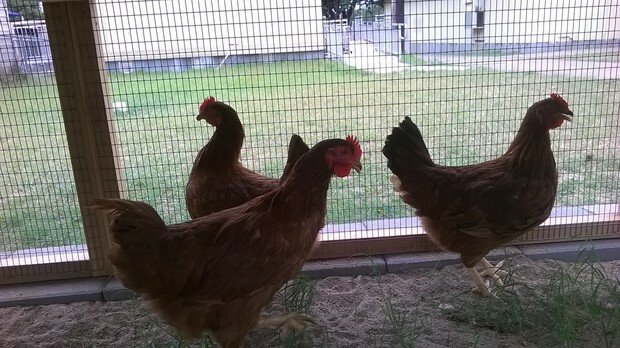 Our three laying hens, Daffodil (yellow leg band), Sunflower (green leg band) and Buttercup (purple leg band) have been summering at Dr. Lepine, MGSA Director's coop. 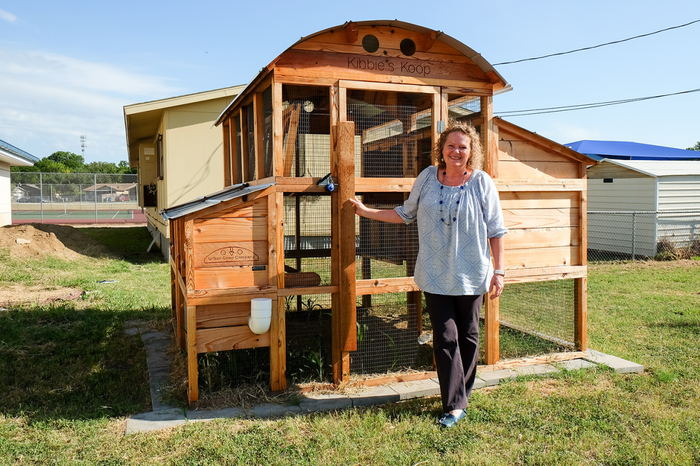 The chickens were to return the weekend Hurricane Harvey made landfall, so the arrival was delayed a week. Students in the MGSA Environmental and Agricultural Science Pathway care for the chickens during the school day, with their teacher, Ashley Stryker. The grant will fund projects at the school- rain water catchment and irrigation for the DSCG and a comprehensive composting plan in collaboration with the school cafeteria. The grant will also fund the shed and tools for the community garden, such as wheelbarrows and shovels. Thank you, Mary Priddy for the opportunity for all schools to participate in the BGFG program! 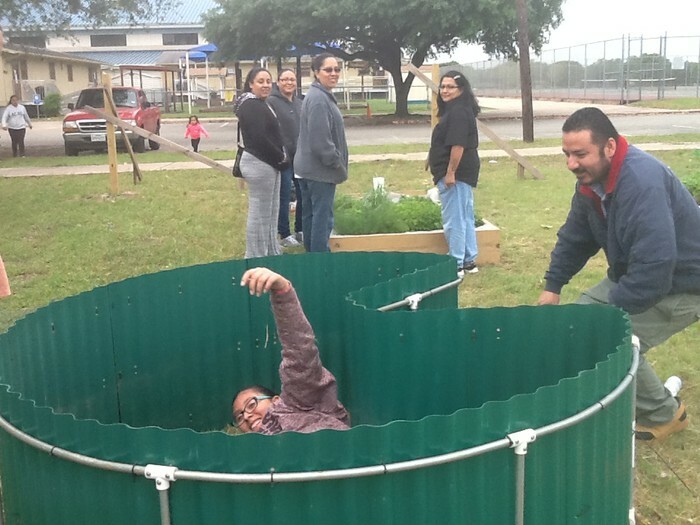 In the Fall of 2016, the Austin Ed Fund granted Maverick Green STEM Academy with the seedling funds to launch the Dove Springs Community Garden and funded the materials for the student's designed entryway. 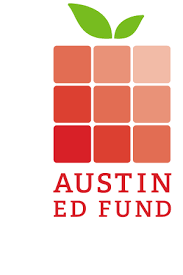 Thank you, Austin Ed Fund, for believing in our students and the power of a community garden to bring us together! 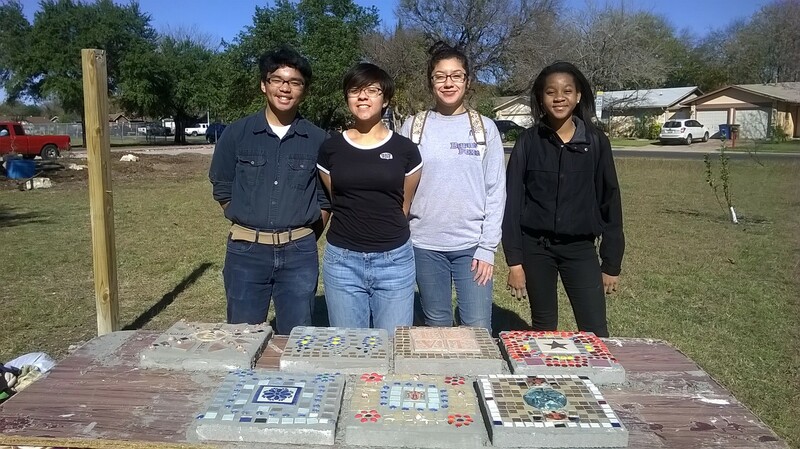 TAS Concrete is a proud partner with the Dove Springs Community Garden and worked to make a student's design come to life. There is more to come to finish the entryway - laser cut panels and espalier fencing (a living fence you will be able to eat!). 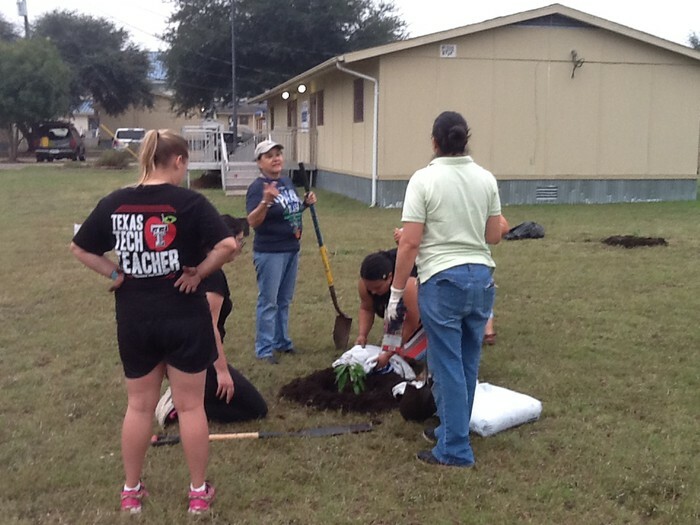 Students worked to plant the pumpkin patch on May 6. 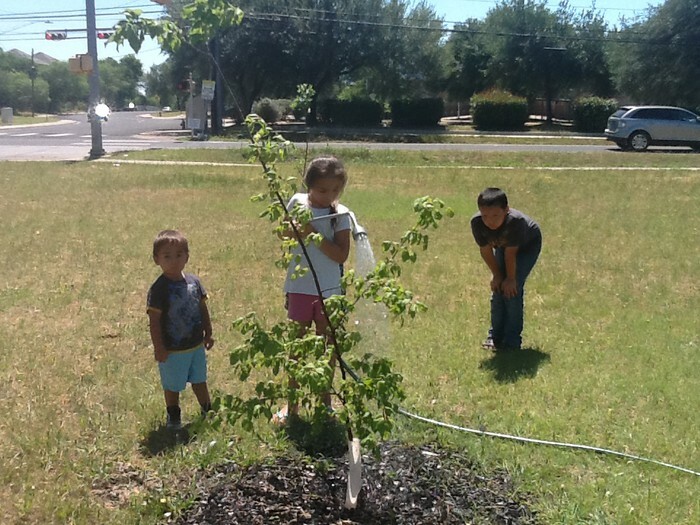 Ms. Rebecca's grandchildren and Ruben water the trees. 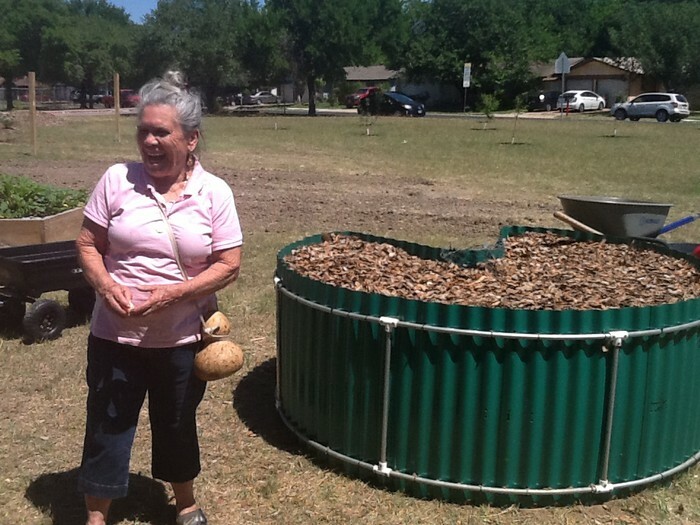 Ms. Rebecca is a master gardener and supporter of the Dove Springs Community Garden. 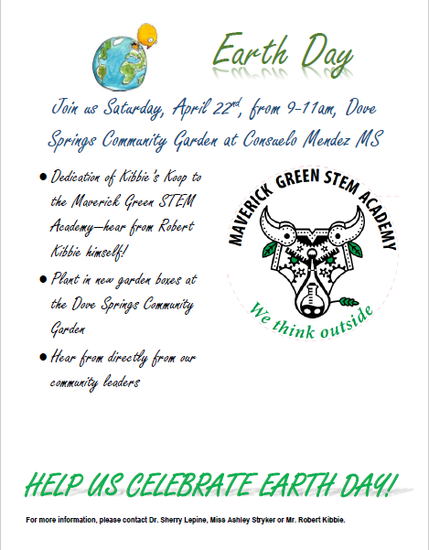 Attention all parents of Maverick Green STEM Academy students and DSCG supporters - we need you! 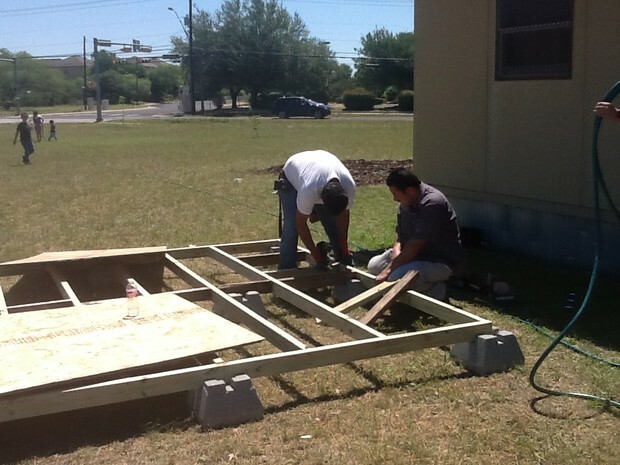 We need a few helpers to construct the 10' x 14' floor for the storage shed for the Dove Springs Community Garden. 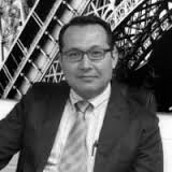 We will have tools and building supplies, and our DSCG Leader, and former Mendez student (now parent of a Mendez student), Alfredo Padilla, would love some help! If you are available from 9:00 a.m. to 11:00 a.m. on Saturday morning, May 6th, we can get the floor of the shed constructed with a little help from our friends. Meet in the east parking lot by the DSCG and CIS Portable. 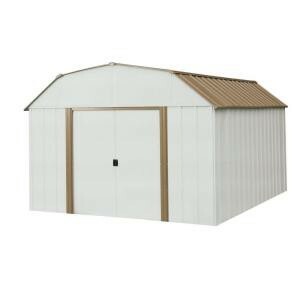 Please help us build our shed! 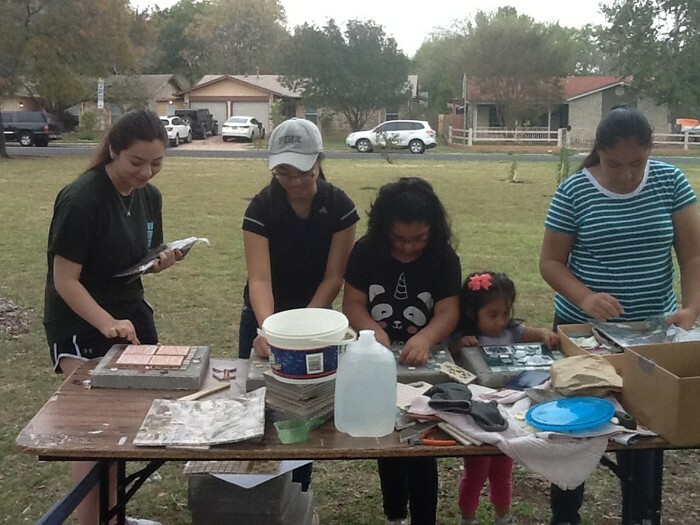 Mayde, pictured in the center of the photo in a gray sweatshirt won a design contest in October 2016- scroll down through this website to see her winning design. 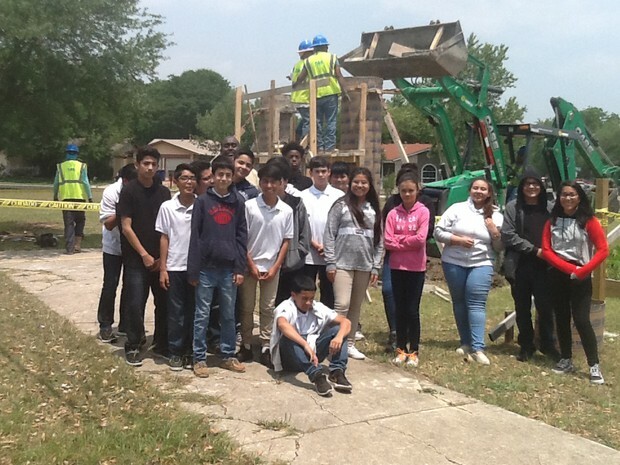 A huge thank you to Raymond Construction who donated all the materials to build the entryway, and to Moises Macias, structural engineer who worked with students on the math involved in design and construction. 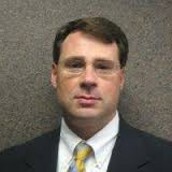 And a really big thank you to Ron Pope, architect who helped make our vision a reality. This is truly Problem-Based Learning with assistance from experts in the field in action! 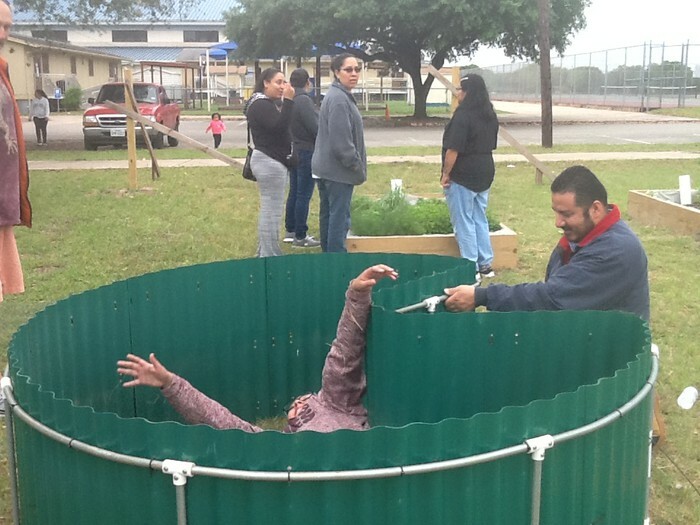 What's Going on at the Dove Springs Community Garden? 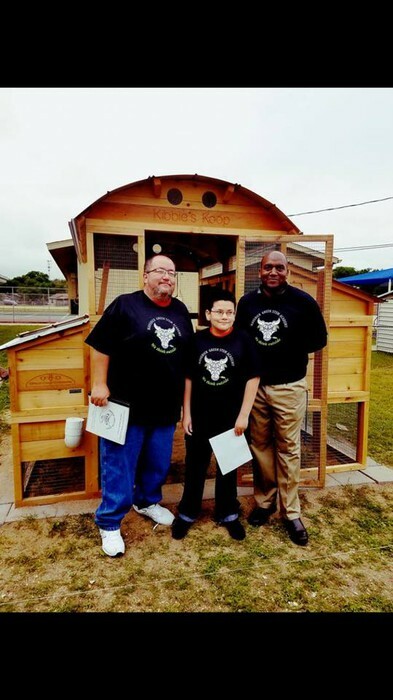 The Mayor's Office Dedicated Kibbie's Koop to the Maverick Green STEM Academy in an official proclamation at a ceremony on Saturday, April 22, 2017 at the newly constructed chicken coop at Consuelo Mendez Middle School. The coop will be an integral part of the agriculture and environmental science pathway - a course of study for students in the academy. 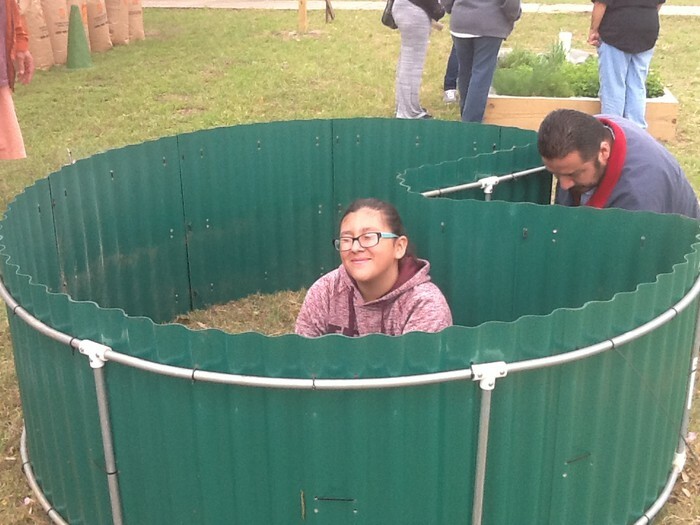 Idey Rodriguez begins her enactment of a potato plant growing from the soil while DSCG Leader, Alfredo Padillo tightens the zip ties on the new addition to the Dove Springs Community Garden. Scene Two: The potato plant is growing! 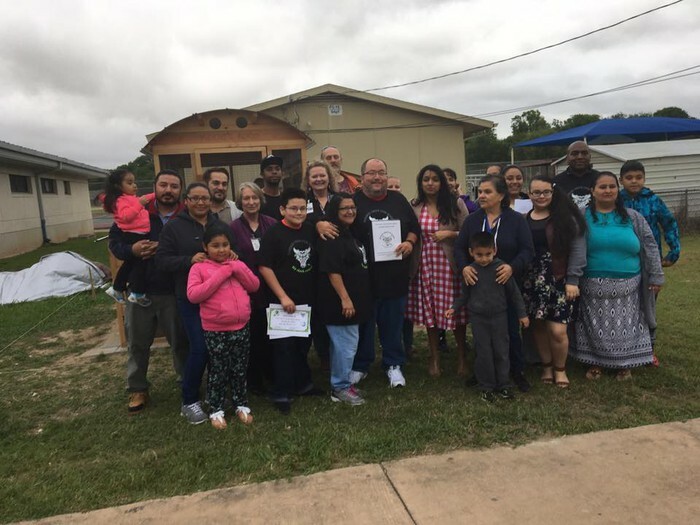 In the background L to R:Erica Mulato, parent, Brenda Kibbie, Akins HS Volunteer, Idey's Mom, Evelia Rodriguez, and Andrea Kibbie, Mendez Staff and PTSA Member. Next Work Day is Saturday April 1st! Join us at 9:00 a.m. at the coop- we will be finishing the build and welcome St. Edward's students who will join us to kick-off Earth Month with a campus clean sweep! There will be prizes for CMMS students who participate - the biggest piece of trash, most unusual piece of trash, most trash collected. Bring a reusable water bottle and dress for the weather. Students will receive service hours towards the STEM Academy requirement of 8 hours per year. 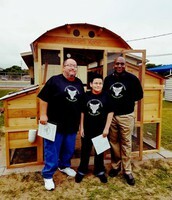 L to R - Matt Kjeldsen, community volunteer, and parents, Alfredo Padilla, parent and DSCG Leader & Reynaldo Rodriguez, parent volunteer, put the dedication board on the coop. 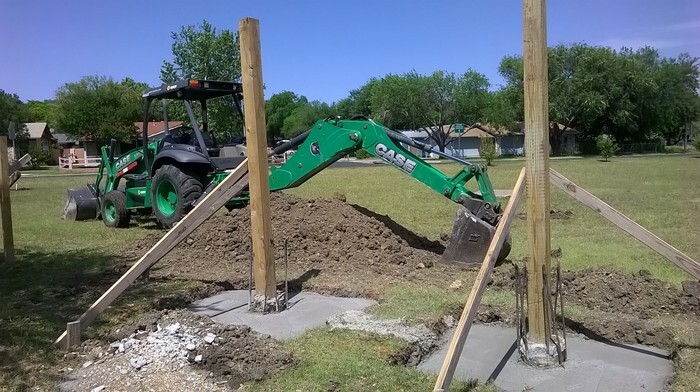 On Saturday March 25th, construction of the walk-in teaching coop, which will be an integral feature of the Maverick Green STEM Academy Ag Science program, began at the site near the portables. 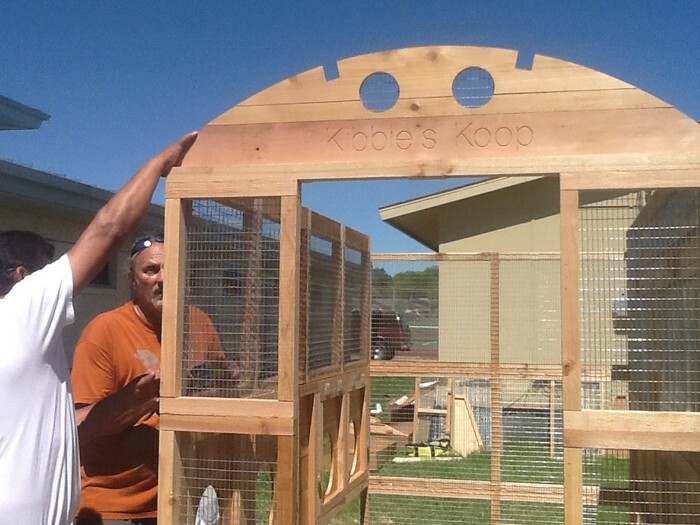 Along with twelve volunteers from St. Edwards, MGSA students and their parents worked to begin the assembly of the coop, named "Kibbie's Koop" in honor of 7th grader, Robert Kibbie, who wrote a grant with his Green Ag teacher, Ashley Stryker to bring the project to our campus. The coop construction will continue next Saturday, April 1st, when St. Edwards brings another round of volunteers to our campus. 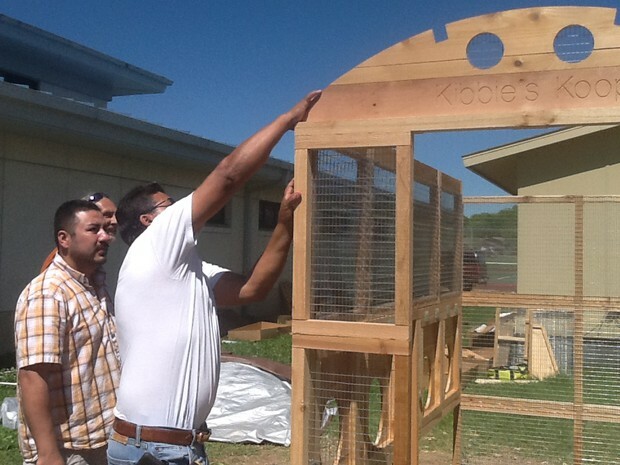 The coop is expected to be completed at the end of the workday on April 1st and ready for chickens. If you would like to volunteer, show up at the site- we will begin working at 9:00 a.m. and work until the coop is completed. A campus clean sweep will also be occurring on April 1st with prizes for participating in the campus beautification day that kicks off Earth Month. Andrea Kibbie and Robert Kibbie, 7th grader, watch as center part of the coop is set. There are two more sections to attach to either side of the coop- nesting boxes and the roosting area will be added on April 1st. Robert Kibbie (far right) worked with his teacher, Ashley Stryker, to write a grant with Phoenix Rising, an organization that supports student innovation. 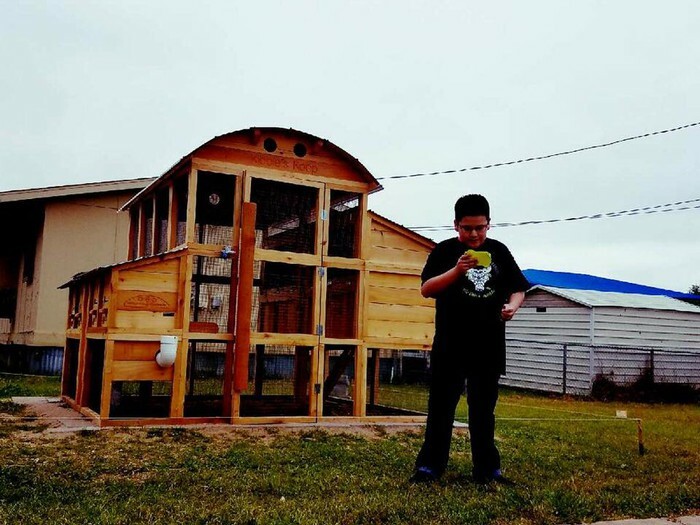 MGSA was awarded a $2,000.00 grant, which was used for materials needed to build the coop and classroom supplies that will support the PBL (Problem-based learning). MGSA Business students will work on the Community Supported Agriculture (CSA) plan and donors will be able to get eggs as well as support Robert's plan to be able to give away eggs to families in our community. If you would like to be a CSA founding member- watch for more info here on this website on how to apply. 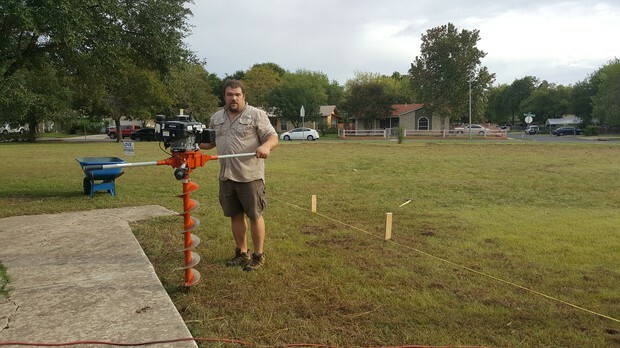 Students in the STEM Exploratory course taught by Miss Stryker worked on a PBL to determine the amount of pavers needed to set the rodent and predator footer that runs the entire perimeter of the coop. 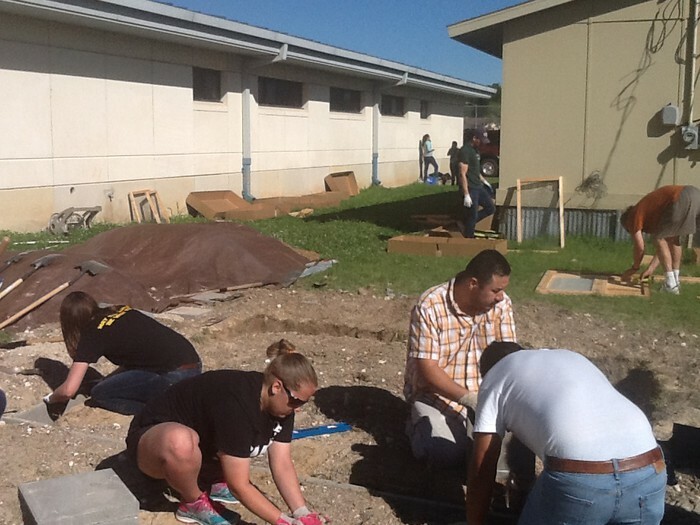 Parents and volunteers are setting the footer. Math is embedded into the curriculum and has real world application, so students see the practical application of their calculations. L to R - Carla from St. Ed's works on the 9 foot side, while Stryker, Padilla and Rodriguez fill in the trench and Kjeldsen in the background assembles the coop. About Halfway Finished in 4 hours! 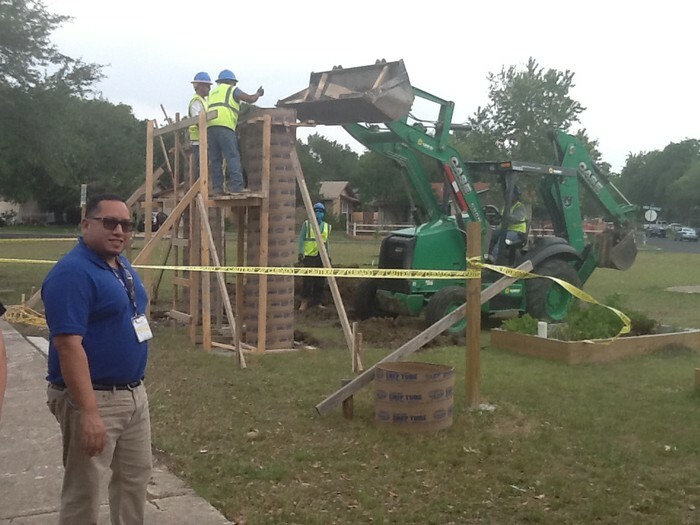 Mr. Rodriguez and Mr. Kjeldsen work to level the structure so it can sit for the week until the next workday on April 1st. 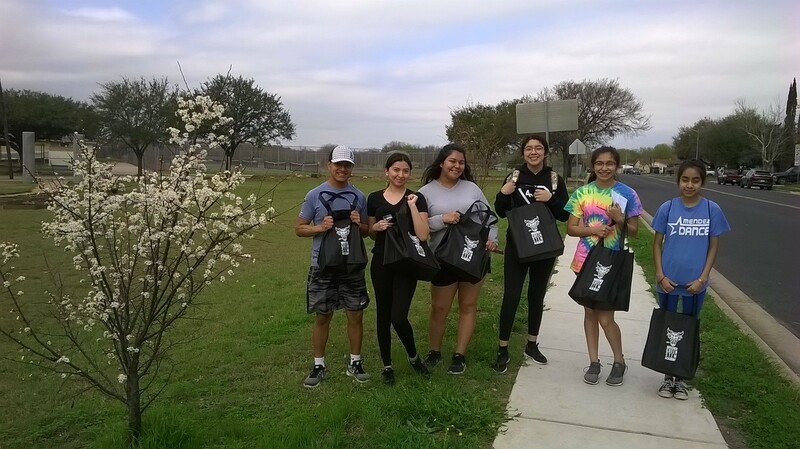 As part of our 30th anniversary celebration, TreeFolks, a non-profit organization helped MGSA students plant a fruit tree orchard at the Dove Springs Community Garden on March 7, 2017. Apples, pears, figs, peaches, pomegranates and plum trees were set out the first week of March. Thank you TreeFolks for your generous donation of trees, time and expertise, as well as on-going help in caring for the new orchard. Students were very proud of their work, and one said, "In five years, I 'll be able to look back and say, I planted that apple tree for our community!" 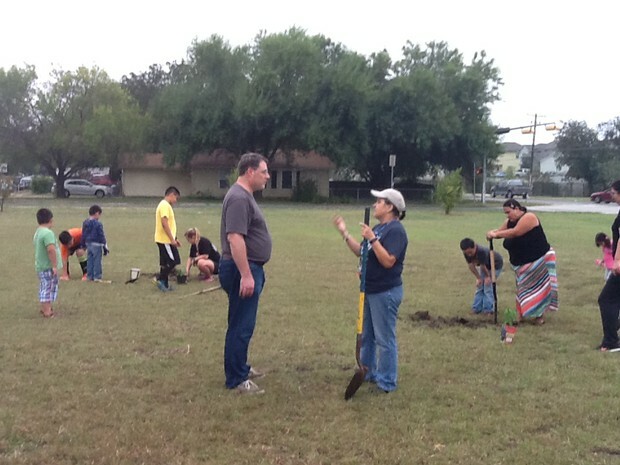 have come together to help create the Dove Springs Community Garden located at Consuelo Mendez Middle School. 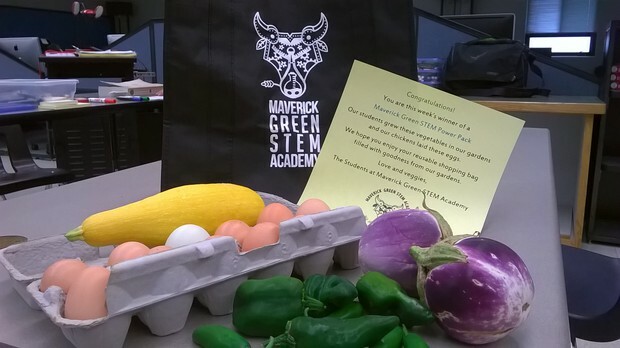 The garden is used for a variety of authentic problem-based learning opportunities for student taking courses in the Maverick Green STEM Academy. Here are some pictures capturing the experiences -- we hope you enjoy. 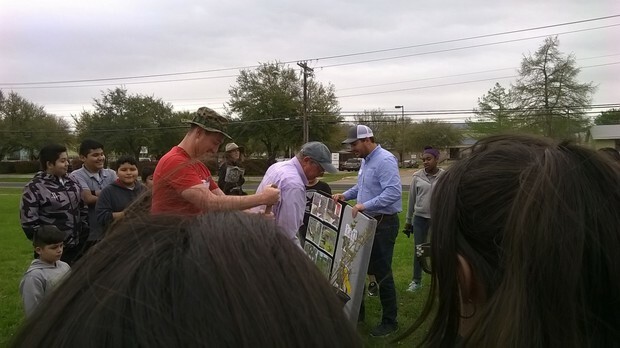 Community Organizer, Gloria Lugo, and Architect, Ron Pope, discuss the orchard layout. 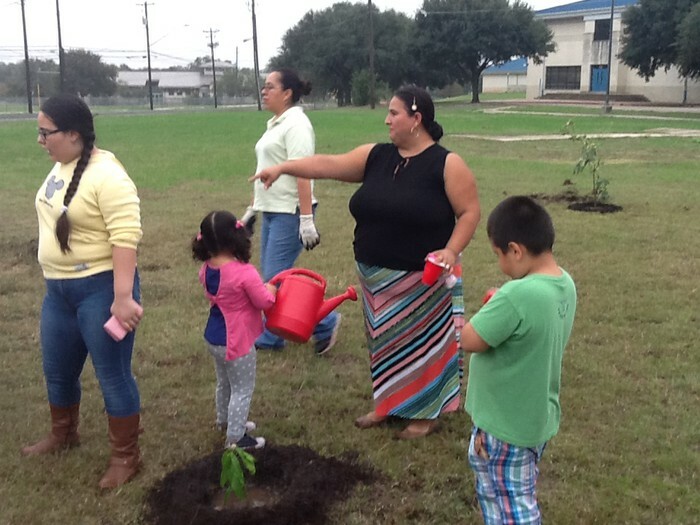 On Saturday morning seven families, two teachers, and various community members gathered at the corner of Palo Blanco and Nuckoll's Crossing to start the orchard. Fall is the best time to plant trees. In about 1 hour, the group planted, two mangos, an orange, a fig, an avacado, and two varieties of lemon trees. 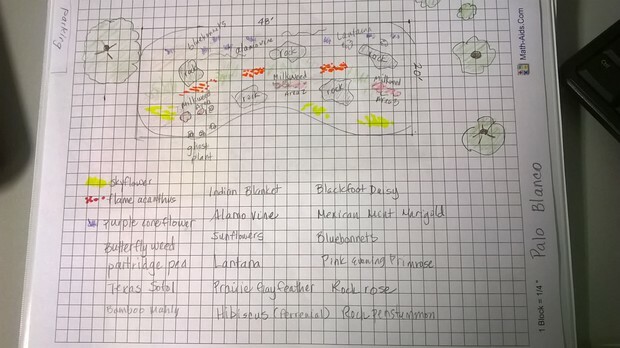 The DSCG is creating a food forest. Holds the auger used to dig the holes for the posts at the Saturday October 1st workday where construction of the student-designed entryway was begun. 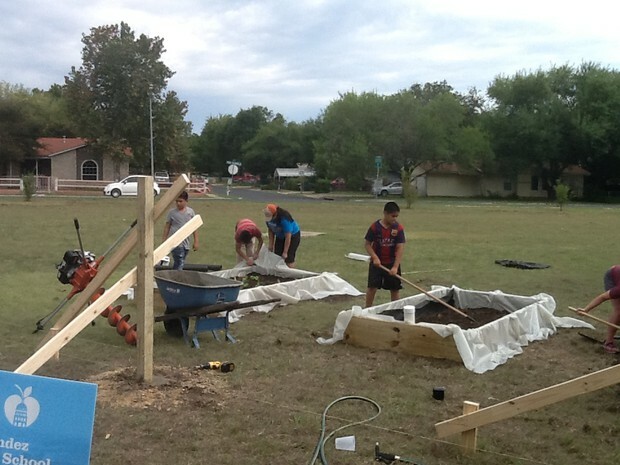 While the volunteers from Austin Bridge Builders set the posts for the entryway, students built the beds that the community can lease. Mr. Olvera's Business Careers classes are competing in a shark-tank style competition to come up with the Business and Marketing Plan for the DSCG. The competition will be held on Friday December 9th during 2nd and 3rd periods. 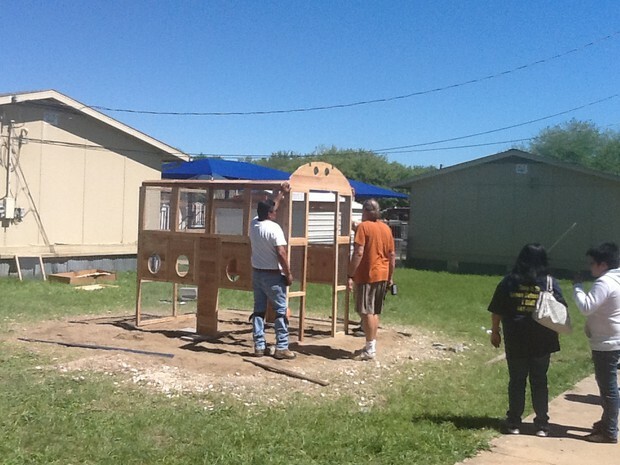 The design will be built out by Raymond Construction who is donating all the time,materials and labor. We hope to be able to pour on December 10th- if weather permits. Designed by Yakira Rector, will feature etched metalwork- for a future workday. Collaboration, Teamwork, and Engineering Design are all incorporated into the Project Lead the Way curriculum. 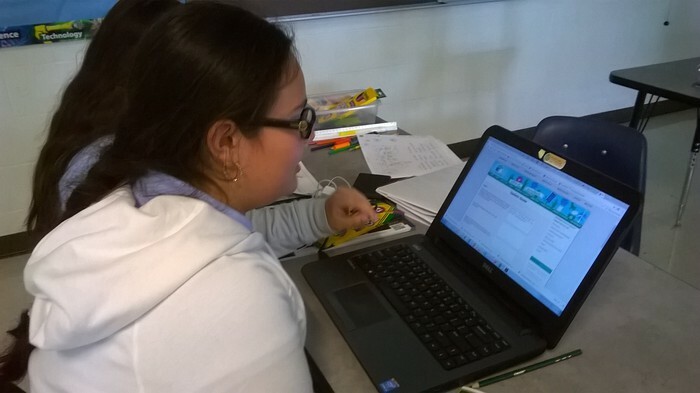 One component of Problem-Based Learning is connecting students with real-world professionals who look like they do. Mr. Macias is graciously donating his time to teach Mr. Wall's students how to move from a 2-D conceptual drawing and use the industry standard auto-cad software that is part of the PLTW curriculum to convert the design to 3-D. He will work with students to teach them the structural engineering needed to build the columns. 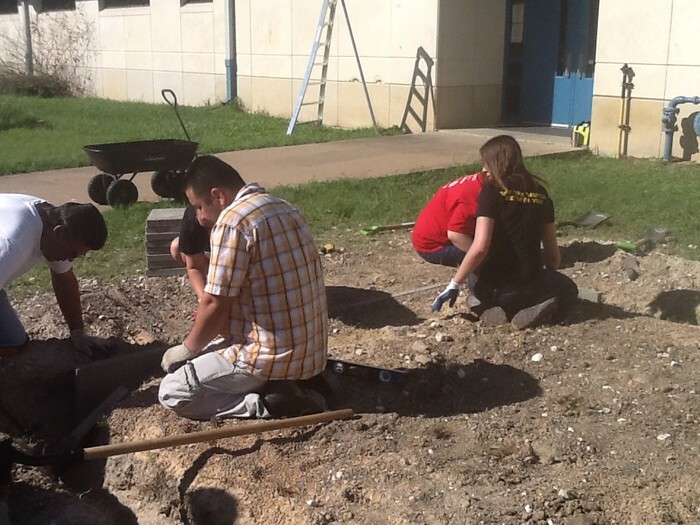 It's nice to have teachers married to industry professionals who are committed to service learning and our AISD students (yes, that's Ramona Pope's husband). Thank you Mr. Pope for connecting us to so many resources that will help our students realize their dreams! 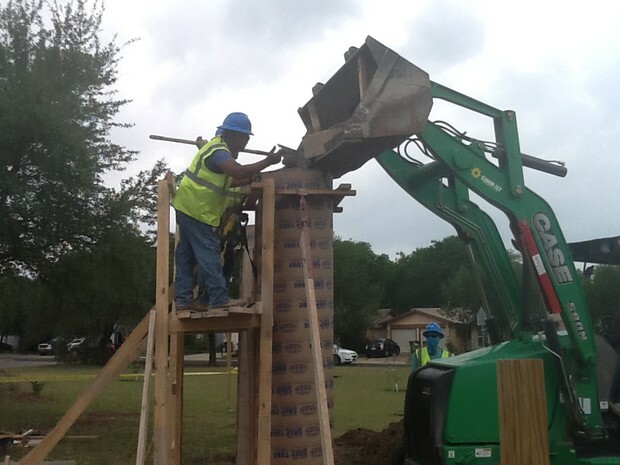 TAS Concrete will be generously donating all materials, labor, time and expertise on the day of the build for the concrete pillars. 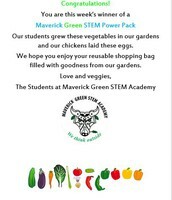 Thank you for supporting Maverick Green STEM Academy students! 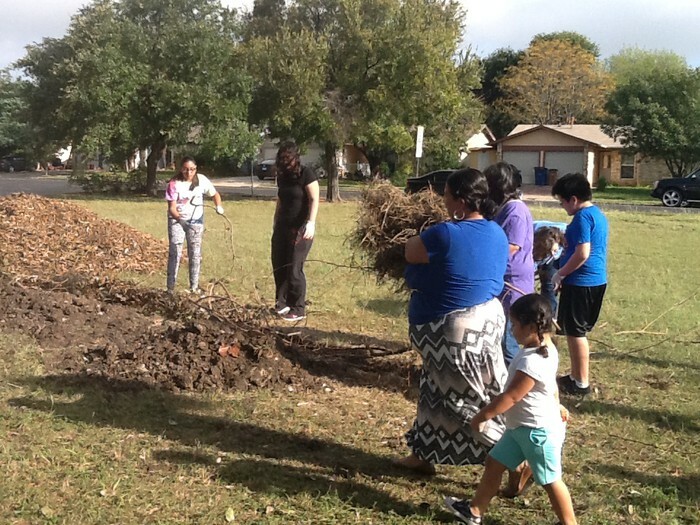 Students in Miss Stryker's class dug a trench that was filled with organic matter- logs and leaves and then filled with dirt. 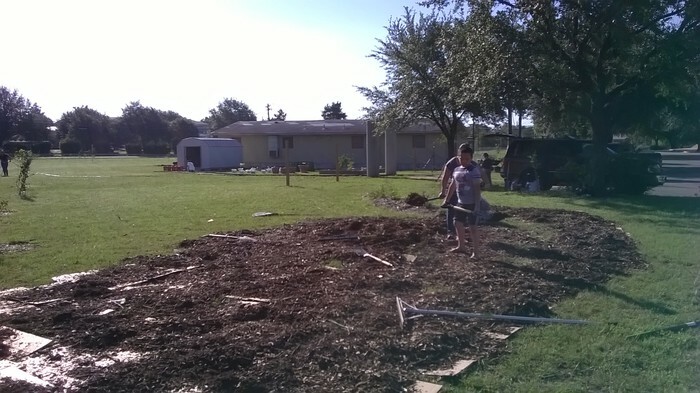 Next a berm was constructed and the milkweed and other flowering plants that are attractive to bees and butterflies were planted and then mulched. Monarch butterflies depend on milkweed for survival. The matter will decompose and turn into rich soil that feeds the garden. 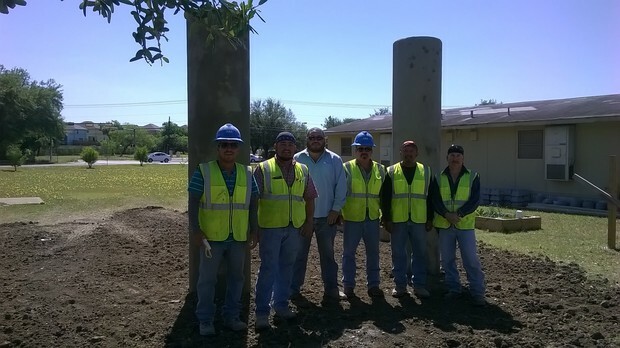 The work crew is happy with the huglekulture pollinator garden. 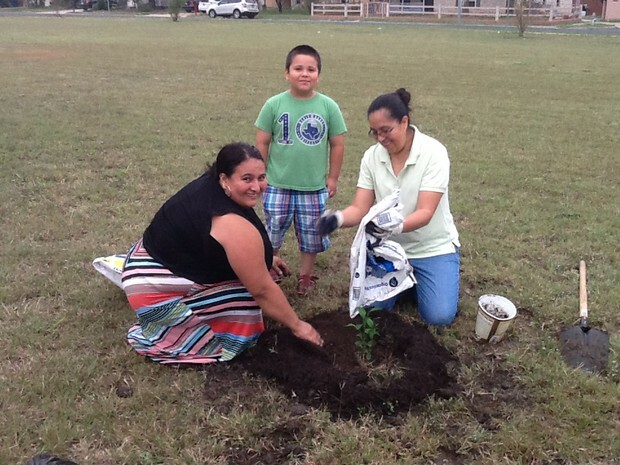 Zuleyka Esquivel with son and Evelia Rodriguez have attend all three garden workdays. 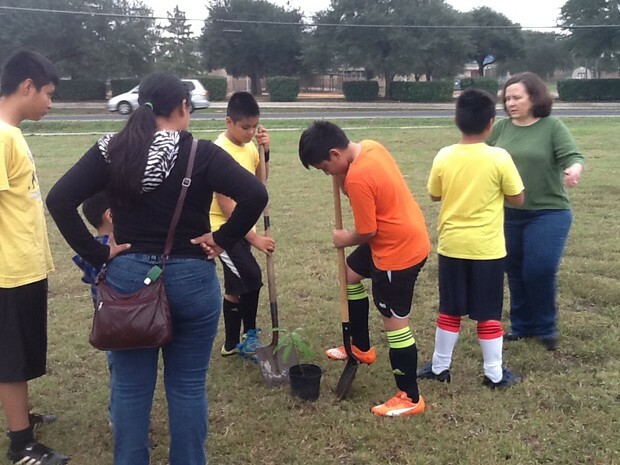 Students learned how to plant trees at the orchard workday. Mrs. Pope has attended all the garden workdays- we appreciate her knowledge and expertise! Makes for a happy avacado tree! Miss Stryker stood in a long line last Saturday to get a free fig tree from Treefolks. Sorry about Tech's loss to UT later that same day (NOT). Everyone likes to water the trees. There are lot's of enthusiastic helpers at the garden on Saturdays. 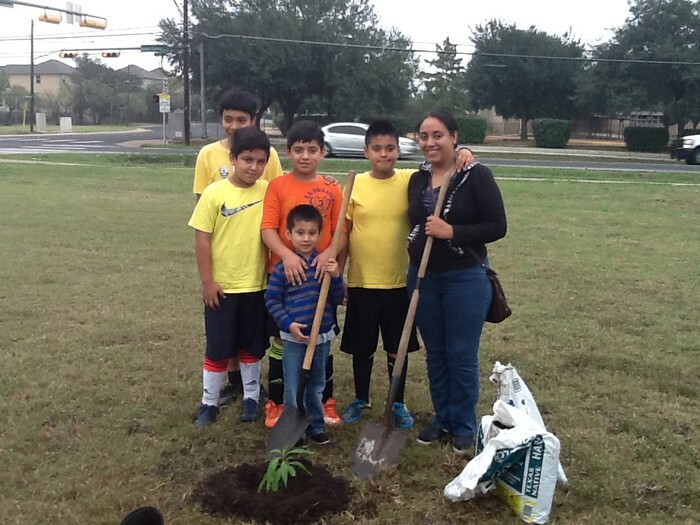 Planted a mango tree after playing soccer! June 3rd- Google workday cancelled - they were unable to commit to our garden at this time.